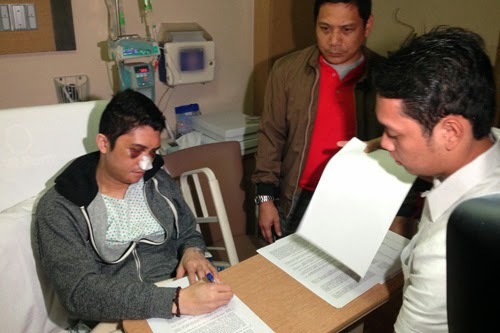 After a successful surgery of Vhong Navarro, he is now ready to fight for justice. This is something that fans of the said actor are waiting for him to do – Vhong alreadymade a sworn statement right after his surgery. The six-page statement was signed by the actor on his hospital bed at around 2:20 pm, Tuesday, and he was assisted by his legal counsel Atty. Alma Mallonga and Chito Rono, his manager. Vhong Navarro is now ready to face the world and file charges against those who are responsible for mauling him. The cases to be filed by Navarro’s camp are serious physical injuries, illegal detention, grave threats, unlawful arrest, grave coercion and blackmail. These charges will be faced by Deniece Cornejo, Cedric Lee and others. The question now is who is the real victim? The house is divided in this matter. Sentiments keep pouring out in social media and there are so many things to come that we need to look forward to in order to solve this case. If you would like to know more about the issue and what will happen in the days to come, you have to stay stuck to this website. You can also give your own judgment with regards to the case and all its matters. This news is rejoiced by Vhong Navarro’s fans who are constantly fighting for him online and of course, the defense will be on the side of Cedric and Deniece though they also file charges against Vhong. Be updated on this case in our future post here.